The Enchanted Tiki Mask was released at the launch of Battle For Azeroth, however a recipe to craft this pet was not included initially. In Patch 8.1, enchanters can loot this recipe from the King Rastakhan encounter in the Battle of Dazar'alor raid. Blasts the enemy with a beam of arcane power, dealing 295 Magic damage. Deals 197 Magic damage, reduces the target's damage by 25% for 2 rounds and increases the user's damage by 25% for 2 rounds. It seems that the recipe is a guaranteed drop from King Rastakhan for everybody in the raid that has BFA Enchanting. The pet takes a mere 20 Gloom Dust and 2 Umbra Shards to create making it an excellent way to max out Enchanting. The tiki mask is roughly twice the size of its counterpart, the Accursed Hexxer, and makes pygmy noises when clicked. Comment made by Nekyr in Wowhead: "As of the current 8.1 PTR build, this pet's recipe is learnable by enchanters and craftable. " As of 9/5/18 this pet has been "removed" from the pet list in-game. Perhaps it will show up later in the expansion as a craftable pet from enchanters. 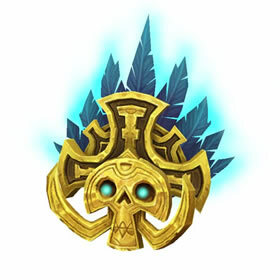 The Zandalari are masters of magic and communications with the spirits, and they often imbued items with powers to strengthen their bonds with the spirit world.